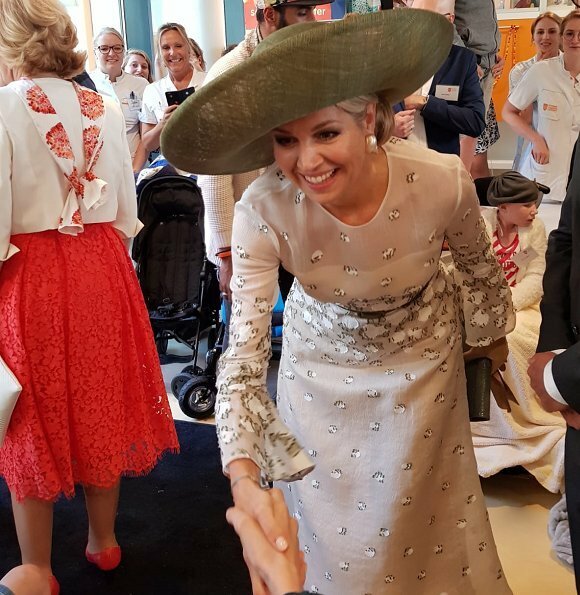 On June 5, 2018, Queen Maxima of The Netherlands attended the opening of new building of "Princess Máxima Center for Pediatric Oncology" in Utrecht. 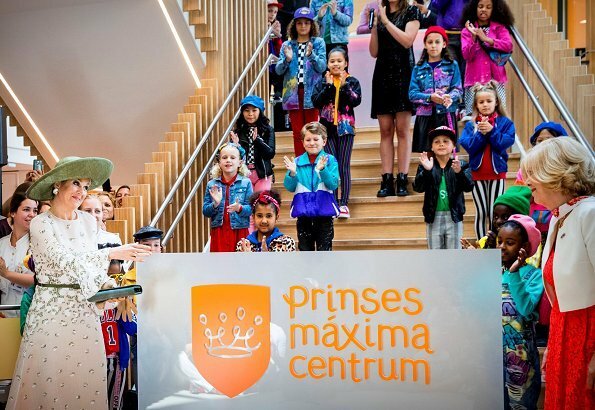 The Princess Maxima Centrum for Pediatrix Oncology (Prinses Máxima Centrum voor kinderoncologie) has special facilities for children with cancer, such as parent-child rooms. The Princess Máxima Center is fully specialized in pediatric oncology. Maxima, always a favorite messy hair or not! I think she’s the most warm and charismatic of all Queens and Crown princesses of Europe. She was born for the job! Yes you are right - nobody is perfect. And messy hair, so what?! It's the character ad charisma to make how present a person is for other people. Otherwise she has (normally) a stylist and a hairdresser and I assume that they do their best when they made their jobs. But I think Queen Maxima often does her hair by herself and does not attach great importance of her hairstyle. Wow she looks gorgeous! I love this outfit. This is a beautiful spring-summer dress and hat that doesn’t hide her face. Can’t believe it’s a Natan. Is this silk voile? She does look gorgeous at this very worthwhile event. My previous comments about stilettos carry here as well. Will not mention my opposition to them again. Woman in red is lovely, too, and good shoes! And all the children are gorgeous as well. As I was trying to writen yesterday before my PC made problems, Natan has many different styles! It is up the customer (Queen/Princess) to make the right choice for herself. That is where I think personally that Mathilde is not always doing the right choice. So blame the customer rather than the designer. Today's visit to the Pss Maxima Children Center,remind us how lucky the people are who have healthy children. 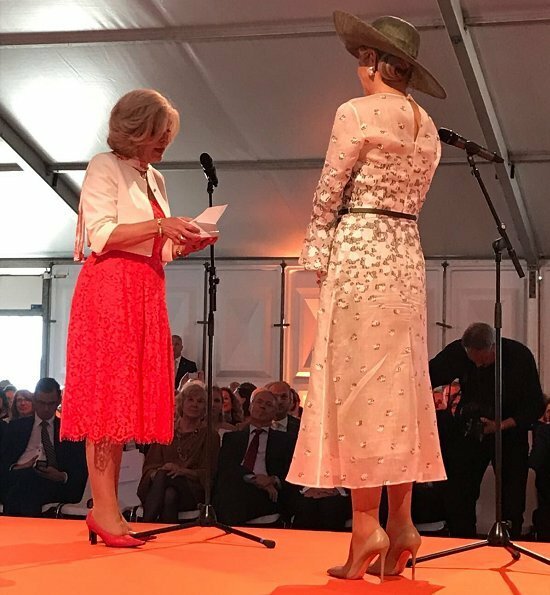 Maxima's dress and big rimmed hat are spot on. Fabulous dress; fabulous hat; fabulous Maxima. Fresh green floral for early Summer. Why is she called princess? This project was starting before she was a Queen. And girls (children) and 'princess' is a good combination. Better than the word 'Queen' . 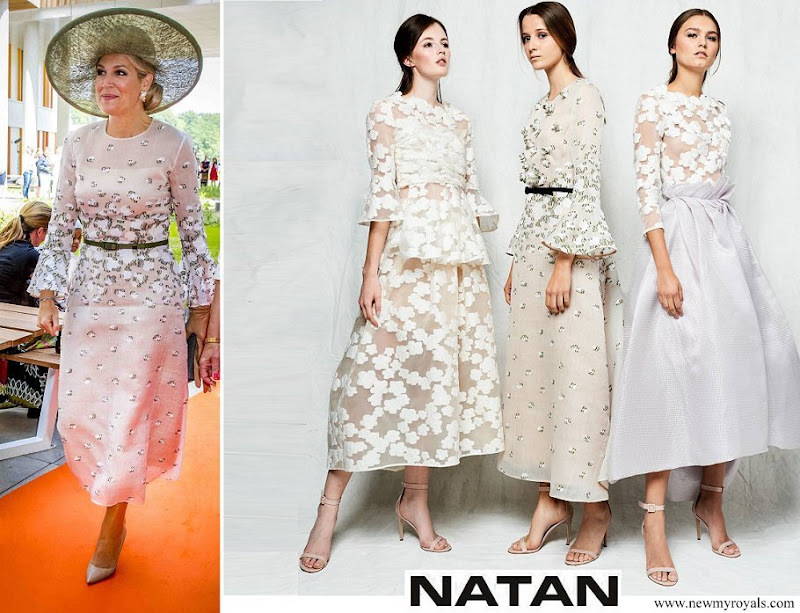 Maxima is a Queen, and she wears like the queen she is. It's actually Queen Maximá who opened a new building of the Princess Maximá Centre. The institute was given this name during the reign of then Queen Beatrix when M. was a princess. I think she is overdressed for the occasion however nice the dress may be. She looks lovely - love the dress, love the hat although I'm not sure it's necessary for this occasion. Anyway, she seems her usual enthusiastic and friendly self. That green hat is the wrong colour for her. Pretty dress though. 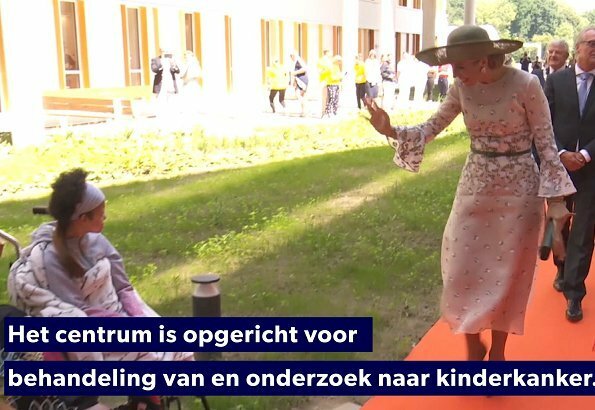 It seems to me that both the dress, the super gigh heels and the absurd hat are more appropriate for a wedding than for a visit to a pediatric cancer center. So much flamboyance seems somewhat insensitive. It’s not just a visit, it’s an official opening - hat required. The hat is ridiculous. She overdoes it. On the contrary. The children are having a party, the queen is paying them a visiting. She is there for them, on a special day. What do you think children prefer when the queen comes along? A beautiful festive queen or just some modestly dressed person? I totally agree. She is a show off. Yes, hat is too big. This is a common accessory for Maxima and I do think it is to keep all attention on her. It is not necessary since as queen she will have the attention and cameras on her. @L.M. van Dijk - I totally agree and I am sure, the Queen does not want to show off. She dressed with the children in mind and made sure she dressed like a queen, however “overdressed” she may seem to some? Gorgeous frock, hat is a bit too much. 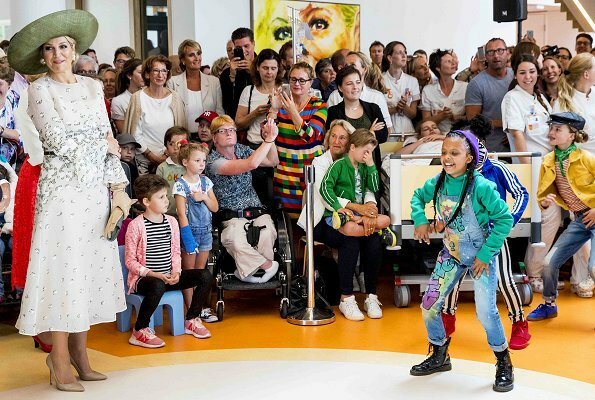 Princess Maxima of the Netherland's newly opened building for children's cancer is very important and meaningful, I think.